If you feel a bit down during the winter months or especially tired in the run-up to Christmas, you may be a Seasonal Affective Disorder (SAD) sufferer. Far from being an excuse to slack off at work, SAD is an accepted strand of winter depression, brought about by a lack of sunlight. While low energy is perfectly normal in winter months, in most cases the other Seasonal Affective Disorder symptoms are not. A lack of sunlight is the main medical reason behind the disorder. Helen Hanson, SAD Association member, explained it “creates a biochemical imbalance in the hypothalamus, a part of the brain which regulates a wide spectrum of body functions”. It is generally accepted that a strong link exists between SAD and sleep (or lack thereof). “The nerve centers in the brain controlling our daily rhythms and moods are stimulated by the amount of light entering the eyes,” explained Hanson. “During the night the pineal gland produces melatonin which makes us drowsy and suppresses the production of serotonin. At daybreak the light stops this process, but on dull days, especially indoors, not enough light is available to trigger this process…Our circadian rhythms become disrupted and so do our sleep patterns,” she added. 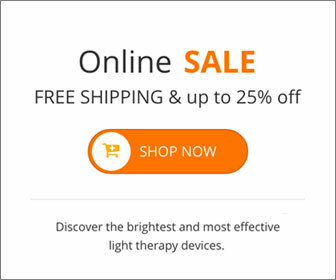 Light therapy is the initial treatment for seasonal depression. Using a light box for half an hour each morning simulates actual sunlight and wake up the sufferer more naturally. General good sleep practices can also help to treat seasonal depression. These include reducing caffeine consumption from mid-afternoon onwards, avoiding alcohol three hours before going to bed and sleeping in a completely dark room, amongst a host of other common-sense tips to help you sleep. What you eat can also help reduce the effects of SAD, with the Omega 3 and Vitamin D-producing super-fish mackerel being especially good. Just in time for Christmas, turkey is coincidentally a fantastic source of serotonin, and is perfect to top-up depleted resources during the darker months. Avoidance of ‘comfort-eating foods’ is also recommended, with sugar-heavy foods such as cake being unfavorable for a good night’s sleep. There are also medicinal treatments to help minimize the impact of SAD depression. Timed melatonin taken three hours before bed may be beneficial along with traditional, non-sedative antidepressant drugs. There is also cognitive behavioral and complementary therapies. This entry was posted on Tuesday, October 29th, 2013 at 8:18 am	and is filed under SAD. You can follow any responses to this entry through the RSS 2.0 feed.